It’s been two decades since 6-year-old Calvin, and his tiger-sidekick, Hobbes, left the comics pages, leaving readers bereft for their wit and wisdom. Cartoonist Bill Waterson retired the comic strip, a daily staple since 1985, in 1995, claiming that “A comic strip, like anything else, has a natural life span.” However, in the decade that Calvin and Hobbes cavorted across the funny papers, they became a worldwide favorite that remains intensely popular today. 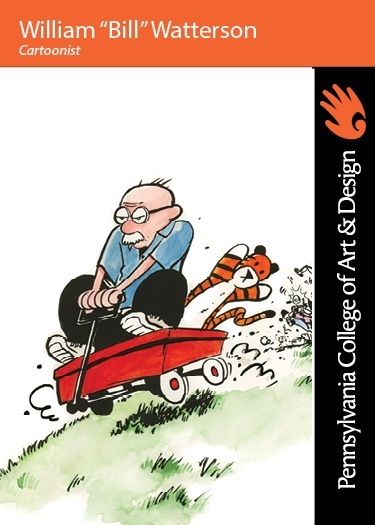 In an interview in March conducted by Jenny Robb, the associate professor who curated an exhibit of Watterson’s work for the Billy Ireland Cartoon Library and Museum, at the Ohio State University, the cartoonist talked about his art, his training and his inspiration. Began working as cartoonist at the Cincinatti Post as well as a designer as part of a smaller advertising firm. Began work on Calvin and Hobbes in 1985 and officially became sydicated that year. Drew inspiration from artists such as Pogo, Krazy Kat, and Peanuts. Recieved incredible commercial and critical success for Calvin and Hobbes, including 8 Harvey’s, 2 Eisners, and the Grand Prix of Angoulême International Comics Festival. Fought against the commercialization of newspaper cartoons and denied any licensing of his work. Returned to a private life after retiring Calvin and Hobbes in 1995. The official Calvin and Hobbes website is http://www.calvinandhobbes.com/.